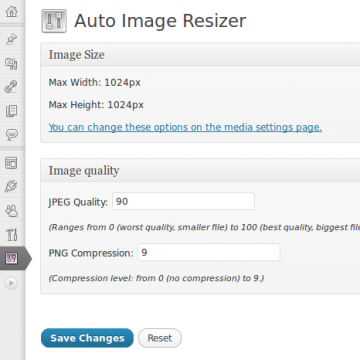 The Auto Image Resizer is a state of the art WordPress Plugin which reduces your uploaded images to the maximal used image dimensions of your WordPress website. If the uploaders (author, member, whoever) browsers supports html5, gears, flash or silverlight the images will be resized directly on the client otherwise the server will do that. So the plugin works in every case regardless of the clients browser or OS. If a user uploads a new image to the media library, to a post or a page (or a custom post type) the plugin analyses the image dimensions automatically and unnoticeable. If the uploaded image is bigger than the defined maximal image dimensions it will be reduced to the maximal height and width without cropping or deforming it. If the uploaders browsers supports html5, gears, flash or silverlight the images will be resized directly on the client before uploading them. Then the reduced version of the uploaded image will replace the "large size" version of the image. This saves your web space the traffic of the website visitors. In the free version of the plugin you can test the plugin as long as you want but with a small limitation: The free version can handle sepia images only. Of course in the pro version you can upload true color images, too! You can find the free version of the plugin here. Download the Lite or Pro version of this extension. The downloaded file should to be a .zip file. If your browser or operating system offers you a directory as download you need to re-zip it on your own or you need to find a way to get the .zip file. Please consider buying the support package. We will install the plugin for you on your server. Go to your WordPress Dashboard and log in with an administrator account. Please deactivate all other versions of the plugin. Especially deactivate the Lite version if you want to install the Pro version. Your already created data will not get lost when you deactivate the plugin! Please navigate to Plugins -> Add New -> Upload. Then please upload the before downloaded .zip file of this extension. When the upload was successful, WordPress will offer your to activate the plugin. Enter your license credentials to get the updates directly via the dashboard. As soon as the plugin is activated it is operable. By default the maximal image dimensions from your current media settings will be used and there is a small set of default options. 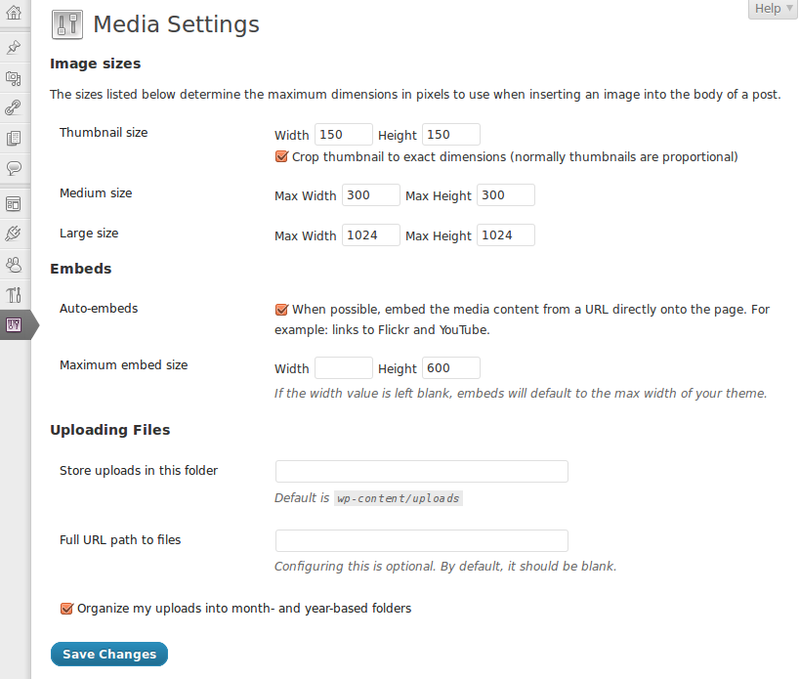 You can change the maximal image dimension in Settings -> Media -> Image sizes -> Large Size. 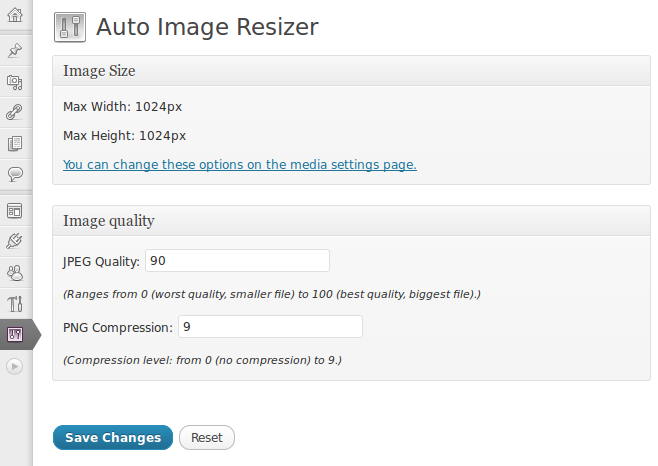 You can change the image quality in Settings -> Auto Image Resizer -> Image quality. 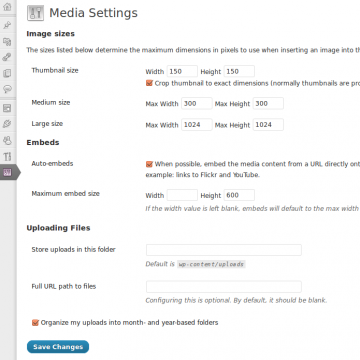 Some Plugins and Themes use custom image sizes for post thumbnail images or header banners. The Auto Image Resizer take care of the image dimensions of other components so your images could be some pixel bigger than your "large size" option. On the Settings page you can enable or disable the automatic updates. To make use of the automatic updates please enter your account details in the corresponding option box. One year of updates and personal 1-on-1 support for one website. If you already bought the plugin this package will add another year of updates and support to your account. One year of updates and personal 1-on-1 support for up to five websites. If you already bought the plugin this package will add another year of updates and support to your account. One year of updates and personal 1-on-1 support for up to fifteen websites. If you already bought the plugin this package will add another year of updates and support to your account. Please choose a plan and your billing country first to calculate the price. For consumers this price includes €4.83 tax. For businesses it is exclusive tax (reverse charge). For consumers this price includes €6.50 tax. For businesses it is exclusive tax (reverse charge). For consumers this price includes €8.17 tax. For businesses it is exclusive tax (reverse charge). For consumers this price includes €5.03 tax. For businesses it is exclusive tax (reverse charge). For consumers this price includes €6.77 tax. For businesses it is exclusive tax (reverse charge). For consumers this price includes €8.50 tax. For businesses it is exclusive tax (reverse charge). For consumers this price includes €5.80 tax. For businesses it is exclusive tax (reverse charge). For consumers this price includes €7.80 tax. For businesses it is exclusive tax (reverse charge). For consumers this price includes €9.80 tax. For businesses it is exclusive tax (reverse charge). For consumers this price includes €4.63 tax. For businesses it is exclusive tax (reverse charge). For consumers this price includes €6.23 tax. For businesses it is exclusive tax (reverse charge). For consumers this price includes €7.82 tax. For businesses it is exclusive tax (reverse charge). For consumers this price includes Kč129.99 tax. For businesses it is exclusive tax (reverse charge). For consumers this price includes Kč173.38 tax. For businesses it is exclusive tax (reverse charge). For consumers this price includes Kč260.16 tax. For businesses it is exclusive tax (reverse charge). For consumers this price includes kr39.80 tax. For businesses it is exclusive tax (reverse charge). For consumers this price includes kr59.80 tax. For businesses it is exclusive tax (reverse charge). For consumers this price includes kr69.80 tax. For businesses it is exclusive tax (reverse charge). For consumers this price includes €5.61 tax. For businesses it is exclusive tax (reverse charge). For consumers this price includes €7.55 tax. For businesses it is exclusive tax (reverse charge). For consumers this price includes €9.48 tax. For businesses it is exclusive tax (reverse charge). This price includes €4.63 tax. This price includes €6.23 tax. This price includes €7.82 tax. For consumers this price includes Ft1914 tax. For businesses it is exclusive tax (reverse charge). For consumers this price includes Ft2551 tax. For businesses it is exclusive tax (reverse charge). For consumers this price includes Ft3189 tax. For businesses it is exclusive tax (reverse charge). For consumers this price includes €5.42 tax. For businesses it is exclusive tax (reverse charge). For consumers this price includes €7.29 tax. For businesses it is exclusive tax (reverse charge). For consumers this price includes €9.16 tax. For businesses it is exclusive tax (reverse charge). For consumers this price includes €5.23 tax. For businesses it is exclusive tax (reverse charge). For consumers this price includes €7.03 tax. For businesses it is exclusive tax (reverse charge). For consumers this price includes €8.84 tax. For businesses it is exclusive tax (reverse charge). For consumers this price includes €4.21 tax. For businesses it is exclusive tax (reverse charge). For consumers this price includes €5.67 tax. For businesses it is exclusive tax (reverse charge). For consumers this price includes €7.12 tax. For businesses it is exclusive tax (reverse charge). For consumers this price includes €4.42 tax. For businesses it is exclusive tax (reverse charge). For consumers this price includes €5.95 tax. For businesses it is exclusive tax (reverse charge). For consumers this price includes €7.47 tax. For businesses it is exclusive tax (reverse charge). For consumers this price includes zł22.25 tax. For businesses it is exclusive tax (reverse charge). For consumers this price includes zł30.85 tax. For businesses it is exclusive tax (reverse charge). For consumers this price includes zł37.21 tax. For businesses it is exclusive tax (reverse charge). For consumers this price includes kr79.80 tax. For businesses it is exclusive tax (reverse charge). For consumers this price includes kr99.80 tax. For businesses it is exclusive tax (reverse charge). For consumers this price includes £4.83 tax. For businesses it is exclusive tax (reverse charge). For consumers this price includes £6.50 tax. For businesses it is exclusive tax (reverse charge). For consumers this price includes £8.17 tax. For businesses it is exclusive tax (reverse charge).